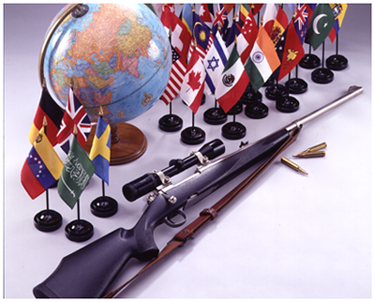 Harris Gunworks - International: We carry the required U.S. State Department License and are capable of handling State licensing, International filings, logistics, and I-TAR when necessary to export even our most sensitive products abroad. Harris Gunworks has decades of experience in handling U.S. State Department licensing, International filings and logistics necessary to export even our most sensitive products abroad. We carry a U.S. State Department License as required, and are I-TAR capable as well. To streamline shipment of client orders with multiple components from multiple U.S. sources, we often will procure and/or handle the export licensing for components or gear manufactured by others, in our licensing and shipping efforts. This saves our clients time and money, when compared to engaging the services of a freight forwarder. Let us ease the demands of exporting our products, or the products of other U.S. Manufacturers, to your country. We have the know-how to handle your international trade needs!